Choosing the best scope for Ruger Mini 30 raises a curious challenge in “modernizing” a classic rifle beloved for its no-frills design. The most recent Ruger Mini 30 sports a post as its front sight and a ghost ring for a rear reticle, a nod to this timeless gun’s military heritage. Ruger has tinkered with the Mini 30’s barrel thickness over the years to improve its accuracy but never to the point of making it a bona fide long-range rifle. It is what it has always been: a 2-3 MOA rifle that’s plenty of fun when plinking targets, deer, or boar at up to 150 yards at most. Nothing more, nothing less. A scope actually adds an interesting dynamic to the Ruger Mini 30’s frequent issues with barrel heat wreaking havoc with its accuracy, scattering shots unpredictably from its initial one-inch groups after just three or four shots. Burris 200437-FF MTAC – The Burris 200437-FF MTAC opens up a clean, bright field thanks to its lenses’ HiLume multi-coating. My images were incredibly clear with impeccable resolution and sharp contrasts. The “off” setting between each level of brightness was surprisingly convenient in terms of sparing turning the illumination off entirely and toggling it back to my previous light. I would recommend that Burris consider downsizing the model’s reticle, however. It seemed oversized at distances past 75 yards and created a distracting reflection at illumination settings 8-10, creating some blurring around the edges. Leupold 115388 Mark AR – Unlike this particular Burris, I unsurprisingly just could not find fault with a Leupold. 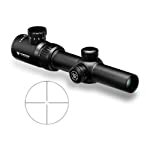 This scope is so immensely popular among competitive AR-15 shooters in no small part because of its immaculately clear field of view right to its edges. Combining the overall glass clarity that has become Leupold’s signature throughout the sporting optics industry with a crisp, well-defined reticle and second-generation argon and krypton interior waterproofing makes it an ideal scope for the kind of fast action the Ruger Mini 30 so famously excels under. There isn’t much that tops Leupold’s par-for-the-course attention to performance-driven design and durability. Bushnell Trophy TRS-25 – I have rarely seen a scope deliver such bright, sharply defined images as the Bushnell Trophy TRS-25’s amber-tinted high-contrast lens coating provides. It’s a dandy scope to shoot in low light and benefits from Bushnell’s typically superb fog-proofing and waterproofing processes, especially the dry-nitrogen-filled housing. Superb, even by Bushnell’s long-lasting standards of consistent excellence. Leupold 115388 Mark AR – I don’t typically think of aluminum-polymer construction first and foremost when listing housing materials that instill instant confidence in a rifle scope’s durability. Leupold does not make “typical” optics, however. In keeping with the manufacturer’s expected standards for tougher high-performance products born of German design and American manufacturing, the ultra-sturdy 115388 Mark AR looks, feels, and performs like a scope built to endure action on the move. I would have no qualms trusting this model on an intense hog hunt in close, brushy quarters. 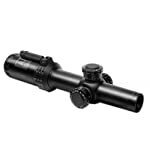 Burris 200437-FF MTAC – Burris counts its quality control as a point of significant pride – almost as much as Leupold, if not equally so. I can’t help but respect any manufacturer who would rather build a better, more reliable scope from the highest-durability materials it can find than skimp on its build to improve its margins. Knowing that this particular model is not only optimized for the equally rough-and-tumble environments common to the AR-15 but covered under a thorough lifetime warranty instills plenty of additional faith in its mettle – and its metal. Bushnell Trophy TRS-25 – It’s really the little things, sometimes. That’s what raised Bushnell above Burris and even Leupold. The Bushnell Trophy TRS-25 has some of the most impressive sealed and tightened knobs of any scope I have tested yet. You cannot examine the thick, durable waterproof gaskets without coming away convinced that their inner workings will forever remain dry as the tip of a cactus needle. Just as impressively, you won’t need more than a dime to make windage adjustments so tight, an earthquake couldn’t shake them loose, let alone the Mini 30’s recoil. Like any Bushnell, the TRS-25 is also about as close to infallibly fogproof and rustproof as any scope can get. Finally, the long-lasting CR2032 battery powering its light will hold out more than a year before you even need to think about replacing it. Bushnell Trophy TRS-25 – This is a perplexing impression. Honestly, what do I say about a scope with a single magnification? Incredibly, almost everything else about its design still makes it remarkably accurate, but I just can’t chalk its actual zoom up as a high point. Leupold 115388 Mark AR MOD 1 – Magnification isn’t exactly as pressing a consideration when scoping the Ruger Mini 30 as improved accuracy or a clear sighting picture, but it isn’t exactly a “moot” point, either. Leupold “only” offers 1.5-4x magnification with a 20mm objective lens, but at the Mini 30’s ideal range, that limited zoom won’t cost much in the way of accuracy. Cranking it up to 4x for longer shots is fine, although the eye relief can be a bit short, and leaving it around 1.5x for faster, closer shots is equally effective. All in all, a fine balance. 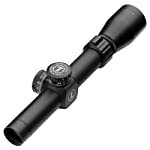 Burris 200437-FF MTAC – The Burris 200437 is ideal for big-game hunting, thanks its versatility to lock quickly onto close targets and suitable magnification for anything under 200 yards. I can’t really say much of any consequence for the Bushnell or Leupold scopes in this regard, but the 200437-FF MTAC’s 1-4x magnification will create a perfect picture of anything within its practical range. A solid scope that somehow improves on a caliber that doesn’t need one. Its field of view measuring 100 feet at 100 yards (low) up to 32 feet at 100 yards (high) gives it more than enough range enough to reign over what is a curiously negligible criterion. Bushnell Trophy TRS-25 – This is easily where Bushnell’s otherwise admirable TRS-25 falls on hard times. The red-dot reticle Bushnell insisted on making a focal selling point is sometimes far more trouble than it could be worth, especially with a rifle literally built for iron sights. The originally sharp, crisp dot becomes blurry and non-concentric under any intensity illumination setting too high for the surrounding ambient light, leading to a certain degree of aggravating fiddling. It performs particularly badly under fluorescent indoor lighting. If you do equip your Mini 30 with the TRS-25, reserve the highest illumination for shooting outdoors on a sunny day. Burris 200437-FF MTAC – The Burris 200437-FF MTAC’s red-dot reticle was just generally frustrating, much like Bushnell’s. This one seemed quite high above the rifle to the point I had to work the gun around to actually see it. To be fair, it is small and sharp, about 1-3 pixels’ equivalent. However, it would have benefitted from a bigger lens to make the finding the perfect angle for acquiring it easier. At best, you should consider buying a new red dot if outfitting your Mini 30 with this one. Leupold 115388 Mark AR MOD 1 – After Bushnell’s aggravating attempt at a red-dot reticle, Leupold’s optional daylight-visible FireGreen illumination was a breath of fresh air. At 4x, I had no trouble acquiring pinpoint targets at 200 yards and drawing down precisely with the duplex reticle. Being measures in Mils, one adjustment click equals about one-third of an inch. By comparison, a typical 1-4x scope clicks in increments of ½ MOA, making Leupold’s exactitude easy to appreciate. The best scope for Ruger Mini 30? No surprise: the Leupold 115388 Mark AR MOD 1 is in a class by itself, like most Leupold optics. The Bushnell and Burris scopes both performed admirably in a number of categories and I was particularly intrigued by the look of Bushnell’s amber-tinted optics and the solid magnification of the Burris scope. However, Leupold’s quality never settles for second-best. As much as I love shooting the Mini 30 with “vintage” iron sights, I wouldn’t hesitate to mount this beauty up top in any setting. Do you Know? How to Choosing The Best Compound Bow?